So I've been thinking about controls recently. Both for a project I'm working on that will primarily be played on a standard controller (the one that hasn't changed much in 17 years) and because I've been playing games that clearly didn't. The most glaring example of that, despite nine major version patches and 18 months to fix it, is Fallout 4. It's everything that you'd expect from an evolved Fallout 3 - a better renderer on top of that clunky old engine (it actually looks better than in screenshots because the temporal AA appears to cycle sample points); a million incremental design decisions giving you a host of new systems to engage with; and another world and story that initially feel slightly empty but the longer you play the more they feel like they're a deep sucking void. But the controls, oh the controls. I started out booting into the main menu to find that because I had a controller plugged in (hardly an usual configuration) that the game had completely disabled the mouse so I couldn't click through the menus. First I had to disable the controller, then I could start on doing basic stuff with the mouse and keyboard. I rebound everything as I wanted it and jumped into the game. Only I hadn't rebound everything because a good half of the controls in the game are not rebindable and actually clash if you do rebind things because they stick to the old WASD layout it defaults to. 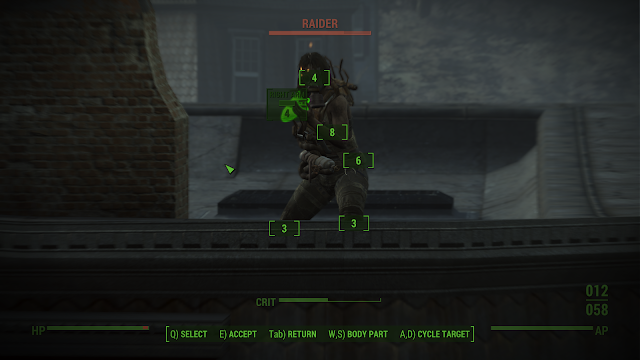 I don't use WASD and yet in VATS I must use QWEASD as my controls. The 'E' to accept in these menus doesn't work. Presumably because I rebound the default for use from 'E' to something else but the thing I changed it to is also a unrebindable default in the interface. 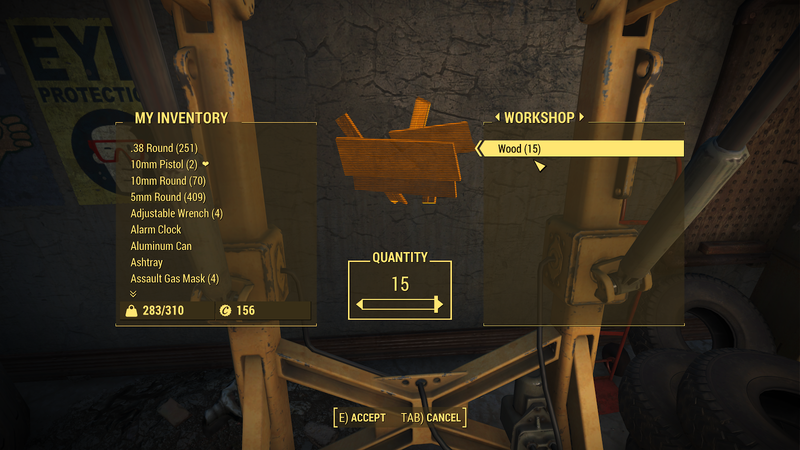 It is from this conflict that I realised that the other buttons in the previous inventory menu (top) are still active on this page. 'X' sorts and 'T' (the thing I rebound use to) moved a load of stuff into the right storage. 'T' does repair, which makes me wonder why 'E' doesn't do anything (bottom). Lovely when you're not expecting it. The 'Alt' here is never mentioned in the interface for rebinding keys. It simply isn't a control they expect you to ever move from the default. So you can't change it. This isn't the only things that got forgotten off the list of bindings, outside of the ones that default to their original bind and then sometimes don't even work. This is a whole different kind of interface FUBAR. 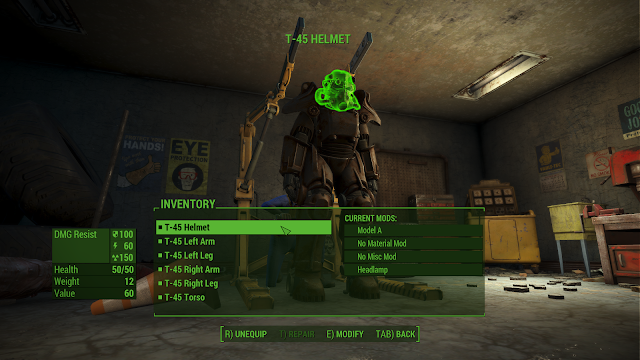 So let's talk about one of the major new systems in Fallout 4: the construction interface. Here you can build your outposts and grab a load of raw materials for the new trash into upgrades system. Only 'R' is bound to scrap the object in from of you. You can't change that binding. I move with RDFG. 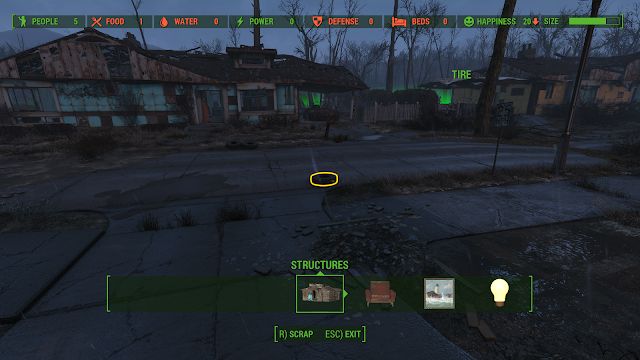 Yep, when I open this interface in the outposts it disables the move forward key. Why offer key rebinding if it doesn't actually work? This is a shameful lack of effort and design foresight. 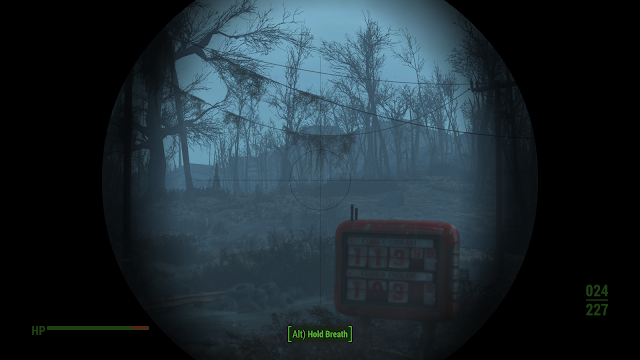 In a game series that is now fully a first person shooter with RPG on top. But appears to only expect players to use a controller and if they do use a keyboard then to not ever rebind anything because that system simply doesn't even approximate a working configuration menu.